Abstract: I think this may be one of the best "bang for the buck" i845PE/Pentium 4 motherboards on the market at the moment! Gigabyte have a solid reputation of building quality components and in the last year the company has "up'ed the ante" with their competition by offering a ton of features while still holding onto their aggressive pricing. The Gigabyte P4 Titan GA-8PE800 Ultra is no exception either, with a retail price of just $145 CDN ($90 US), I think this may be one of the best "bang for the buck" i845PE/Pentium 4 motherboards on the market at the moment! With 5.1 audio, Intel Gigabit LAN, three IEEE 1394 Firewire ports, Ultra ATA133/100 IDE RAID, six USB2.0 ports, Serial ATA/Serial ATA RAID, the ability to read smart cards (reader not incl.) and dual BIOS's what else more could a person want? 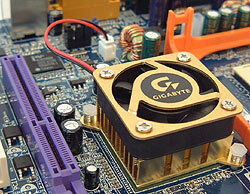 Of course there's also a 4x AGP slot (1.5V lock) for all your videocard goodness... for example an ATI Radeon 9700. Gigabyte even include all the little things needed to set up a brand new computer system; three Ultra/133 IDE cables, three Serial ATA cables, a Molex to 15 pin serial ATA power connector, an SPDIF bracket, USB & Firewire brackets and an external Serial ATA connector bracket. Well done Gigabyte! If you need to expand on top of what Gigabyte include on board, there are still five 32 bit PCI slots on the motherboard to choose from. The three 184-pin DDR DIMM slots can support up to a maximum of 2GB of PC1600/2100/2700 DDR RAM. The software that accompanies the P4 Titan GA-8PE800 Ultra is quite impressive as well, and includes a complete Norton Internet Security 2002 bundle which consists of Norton's anti-virus, Personal Firewall, Privacy Control, Parental Control and Ad Blocking. Even though the i845PE does not officially support 200 MHz FSB, Gigabyte (and others like Abit, Albatron, etc) have released i845PE motherboards that can run 200 MHz FSB. The board can even be paired up with Intel's newest HyperThreading Pentium 4 C (the C beside a P4 denotes a 200 MHz FSB part) processors! As you can see the Gigabyte P4 Titan GA-8PE800 Ultra is quite a colourful motherboard. It will certainly catch your eye, but the colours are meant to help users install components with less chance of problems. The layout of the GA-8PE800 Ultra board is very good, The ATX power connector, floppy and IDE connectors are in the ideal location to the right of the DIMM slots. 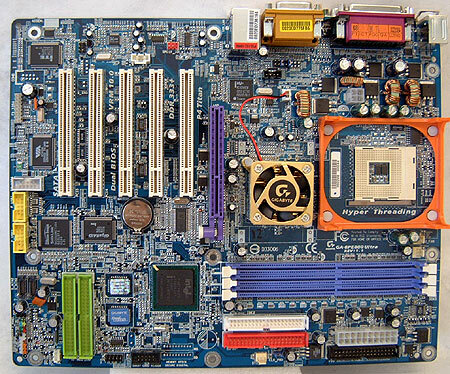 Gigabyte obviously designed the motherboard with the end user in mind, all the USB 2.0, IEEE 1394 and serial ATA ports are on the bottom of the motherboard where they are least likely to get in the way of $500 videocards that require unobstructed cooling. These days we expect that all manufacturers label their motherboards clearly, and it's pretty evident that Gigabyte is trying to make the installation process as easy as possible for the end user. For example the front panel headers are not just labeled and colour coded, they also show the positive values! I can't even remember all the times I have set up a system just to have to open it up to change the front panel cables because the LED cables were backwards. All other headers and ports are also labelled so there is no reason for you to refer to the manual when you're installing the motherboard into a new chassis. Most of the time we do not touch base on users manuals because they're usually all the same, full of techno-jargon that the average user does not understand. 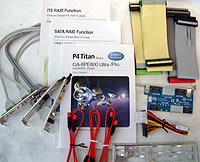 The manual that comes with the Gigabyte P4 Titan GA-8PE800 Ultra though is extremely well detailed, and thorough enough that even novice users should be able to assemble the system will no problems.